I created a video for you today that explains my program called the Millionaire Matrix. I show you how to become a millionaire in 2 short years using this simple system. This is a longer video than what I usually send… it’s about 18 minutes long. Joe: Absolutely, it works. The Millionaire Matrix is a structure that I teach that shows people how they can actually make a million dollars in equity and in cash within 2 years by buying just one property per month using no credit and no down payment. And instead of just me explaining it in this video with a talking head, I’m going to pull up a little power point here and show you exactly how this process works. Joe: I created this little power point to show you what the Millionaire Matrix is and how and why it works. Joe: Before you can understand how it works, you need to understand the principles behind it and why it works. That brings us to the idea of businesses in general. 90% of all of the businesses that start up fail in the first year, whereas 90% of all new franchises succeed. Why is that? Why would franchises succeed and businesses in general, not succeed? And the big answer is – systems. Franchises have step by step systems to show the business owner (the person who’s implementing the tactics in the strategy of the business) how to do each little system in the business. Joe: Let’s take the ultimate systematization – McDonald’s. If you go to a McDonald’s, everything is done the same at every McDonald’s that you go to because each of their processes is spelled out in a specific system. They have a system for making a Big Mac. They have a button to press when it’s time to flip the burger. They know how many burgers to put on there, they know what order to have with a picture of a hamburger, and how to put it together where it shows you that that’s where the bun goes and that’s where the hamburger goes and that’s where the lettuce goes and that’s where the special sauce goes. And it makes it very easy for people that are not very skilled to put together a hamburger consistently all over the world. Whether it’s here in Indianapolis or whether it’s in Wisconsin or California or Berlin or Paris or Ireland – it doesn’t matter – wherever you go to a McDonald’s, you’re going to get the same burger – it’s going to be put together the same way by the same skill level of people. Now, McDonald’s has a 200% employee turnover every year. That means that they’re constantly trying to train new people. For them to get that consistency, they have to have a system in place to make that business work. Joe: That takes us to the next question in the process here, which is what types of deals make you money. You need to understand that as well. In real estate, there’s only two types of deal that’ll make you money. One is properties that you buy substantially under market value, either for cash or as an assignable cash offer. And two is properties that you can buy at market value or below but you can buy them on terms. 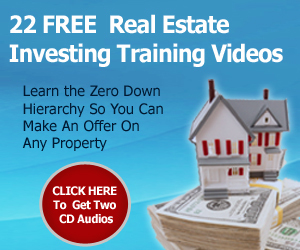 Now, by terms we’re talking about zero down structures that I teach; subject-to, multi-mortgage, land contract, contract for deed, lease option, assignable cash deals. Those are terms and if you can buy properties on terms like that, then you can make money even if you buy them very close to market value. 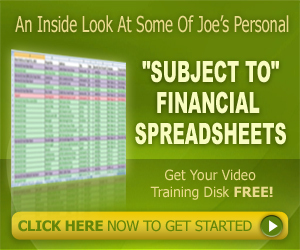 Joe: That’s going to take us to the next step which is the beginners Millionaire Matrix. Now here’s what we want to do with the Millionaire Matrix and the goal of each system. We want to be able to make $5,000 per deal. We want to be able to do one deal per month. We want to be able to work 10 hours per month. That means 2.5 hours per week. 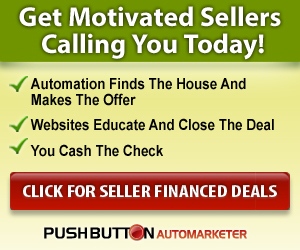 We want to be able to have $200 residual income per deal. That residual income I’m talking means every month you’re going to get $200. We want to buy 10% under market value; it doesn’t have to be dramatically under market value because you’re buying on terms, and I’m going to show you why that makes the difference. And you’re going to want to sell it for 10% over market value and I’m going to show you how to do that. Because we’re selling it on terms as well so we can sell it for more than it’s worth. So this is the basic concept for the Millionaire Matrix. Joe: Now let’s take an example deal – how the Millionaire Matrix and an example deal would work within it. Joe: Every deal is going to be a little bit different and you’re going to make a little bit different amount of money on each one, but this is sort of the model that we’re going by. I used the $100,000 as sort of the market value of the property simply because it’s a nice round number. I know that the market value across the country is all over the place. You should probably go by percentages rather than this but I want to show you, even on a lower end market, that you can still make this kind of money. On a higher end market you’re going to make more money. So let’s start with a lower end market and then you can extrapolate from there. Joe: Let’s say you’ve got a purchase price of $90,000. The market value is $100,000. The financing – you’re not putting any money down, you’re not getting a new loan – you’re buying it subject to the existing loan. Which means that the property is going to be deeded to you and you’re going to take over the payments on the loan – without qualifying on that loan (remember that). You’re going to sell this property for $110,000 to a new lease option buyer. You’re going to sell it on a one year lease option or maybe a 2-5 year lease option if you choose to do that. At closing you’re going to make $5,000 on the lease option fee at closing of this deal. The equity left after the lease option fee is about $15,000. You’re taking $110,000 sale price, you’re taking $5,000 from that, and that means you’ve got $105,000 that they still owe you for the property. You only owe $90,000 so that means there’s $15,000 in equity. Now the monthly loan payment on this 90,000$ loan that’s there – let’s say its $900 a month and you’re going to lease this property for $1,100 a month. This is an example deal. Joe: Let me also reiterate – you’re buying this property subject to the existing loan. That means that you’re not putting any money down and you’re not qualifying for a loan. They’re deeding you the loan. You have complete control of the property but it’s subject to that loan that’s existing on there. You’re buying it for a little bit under market value but not that much under market value. You’re selling it for a little more than market value but not that much over market value. You’re selling it on a lease option which the buyer may or may not exercise. You’re getting a lease option fee at closing – you’re making $5,000 at closing. And you’re going to have that equity left in the property, and if they exercise that option, you’re going to make that other $15,000. You’re going to have that loan payment that’s on that existing loan of $900. And you’re going to get a lease income on that property of $1,100. So you’ve got $200 of positive cash flow every month. So that’s sort of the model of this whole thing. Joe: So let’s go to the next frame here. This breaks down to doing one deal per month over the first year. 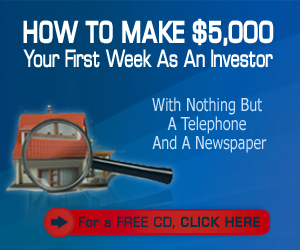 I’m going to show you how to become a millionaire basically over a 2 year period. Month one – let me bring my little arrow up here – cash at closing, making $5,000, that’s the lease option fee. The $200, remember the difference between the $1,100 and the $900 a month payment so that you made $200 a month on that. Equity payoff this month, you didn’t make anything. It hasn’t paid off. Nobody has exercised their option. Equity buildup – you’ve got $15,000 because you bought that property and there’s $15,000 of equity. Remember the spread – you bought and sold it for $110,000, you got $5,000 and they still owe you $105,000, and there’s a $90,000 mortgage. That leaves $15,000 on there that’s your equity. Joe: And then a tax benefit based on $100,000. This is depreciation. If you take this property and you depreciate it by 27.5 years, and then you divide that by 12, you’re going to end up with an actual tax savings in your pocket of about $106 based on about a 30% tax bracket. And these are just general numbers here but they’re pretty close. Joe: Month 2 – you’re going to do the same thing. You’re going to do another property, make another 5 grand, make another $200 a month and so now your monthly residual income is going to go up to $400 a month. You’re not going to get any payoff because the year hasn’t passed yet. You are going to build another $15,000 of equity in the property. And now your monthly tax benefit is going to be $212. Month 3 – $5,000 -same thing – it just goes up every month for the whole year. Let’s go all the way down to the bottom of the year. At the bottom of the year you’ve made $60,000 in cash at closing from just doing these 12 deals. And believe me, I’ve got people that are doing 5 or 6 of these a month on a regular basis because they’ve set up the systems that I’ve given them to do that. 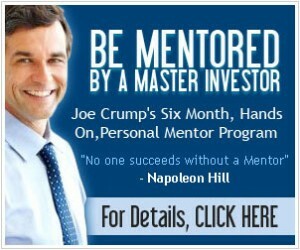 Joe: The next thing is the monthly residual. Just from what’s going on here, you’ve made $15,000 the first year in that; residuals. Equity payoff – nothing’s paid off the first year yet because nobody has exercised their option yet. Equity buildup – you’ve built $180,000 worth of equity in the deal and you’ve made $882 in taxable savings during that first year. So in that first year in the Millionaire Matrix, you’ve made a total amount of cash of about $83,000. You’ve made total equity of about $180,000. 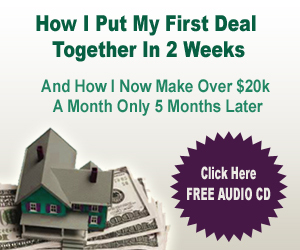 So you’ve just made $263,000 in the first year doing only one deal per month. Joe: Now with these deals, if you have 8 or 10 hours of work into these deals, that’s a lot of time in these deals. So remember there’s a startup learning curve. And there’s going to be the time that it takes to set this process up, to get this system going; all of that stuff. But the actual time of the deals is very, very low. And once you learn how to do it and once you get it going, it’s going to be easy to keep it going. Joe: So let’s go to year two, and look at the second year. Things start to change dramatically in year two, if you’re going by this model. And we have different models that we go by. You don’t have to go by this one. But I’m just taking a simple model and how it can expand your income very, very quickly. Let’s look at month one. You’ve got $5,000, your residual income is now $2,400 a month because you’ve got 12 deals (and you only have to keep 12 deals like this because they’re going to be paying off as they exercise their options). So as the first one pays off and you get your equity out of the property because they exercised their option, you made $15,000 equity payoff in cash plus you bought a new property, so you’ve got $15,000 new equity buildup and now you’ve got 12 months’ worth of tax savings over 12 properties. So you’re going to be making about $1,200 a month in tax savings, which is pretty substantial when you start making this kind of income; it’ll save you a lot of money. Second month – same thing. Joe: Now, keep in mind – this is the big variable – how many properties are going to actually exercise their option? It’s going to be much less than the total amount, so you may not make this full amount. There are ways to optimize this process and get more of the people to exercise their option, and I show you how to do that. I’m not going to spend the time on this video to do that. Joe: But let’s look at the bottom line on the second year. $60,000 – same as you made last year on the cash flow. Monthly residual – it well over doubled. Equity payoff – assuming that they exercised their options, just made a nice chunk of money on equity payoff. 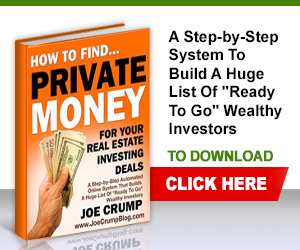 Equity buildup – you make another $180,000 on top of this $80,000. You made $15,000 in real cash money in your tax savings through depreciation, so it was a really nice year two. Then your second year on the beginners Millionaire Matrix is total cash at $284,000, and total equity of 180,000$. The grand total of year two is $464,000. I add that to the $263,000 and you’ve got $750,000 in your first two years, not quite the million that I promised you but pretty darned good. Joe: Let’s say you get better at what you do, that you get a little bit better at the process. As you’re doing this, how much will you improve? Will you get 100% better? Will you get 75% better, 50% better, 25%? How much better are you going to get at this process after one year? I venture to say that it will be more than you think. But let’s say that you only get 25% better. If you get 25% better at better price from the seller on your property, instead of getting 10% under market value, you get 12.5% under market value. Not very much – next to 2.5% better on your price. Let’s say you get 25% down from your buyer so instead of getting $5,000 down you get $6,250 down. Let’s say you get 25% more lease money monthly and your $200 goes to $250 a month. Let’s say you get 25% higher price from your buyer – instead of getting $110,000, your price goes up to $112,500; not that much more. And you do 25% more deals a year so instead of doing 12 a year you go up to 15 deals a year. Now this is very realistic to think that you can get just 25% better. I have people that get 100% to 500% better at what they do and their production goes up with that statistic. The ability that you have and the talent that you have in this grows as you do it. This is a skill and you build that skill through this process. Joe: So let’s look at the second year Millionaire Matrix if you’re 25% better. Now you’re making $6,200 instead of $5,000 so that jumps that up from $60,000 to $93,000. That just increased your income by 50%; right in the first column. The second column goes up a good deal as well. Your equity payoff went up almost $100,000. Your equity buildup went up by $100,000. Your tax benefits, well, they didn’t go up at all. But still, you just increased your income by a substantial amount of money. So just getting 25% better at the second year of the Millionaire Matrix – now you’ve made $730,000 that second year. You made $260,000 the first year, so NOW you’re at the million dollars. Joe: This is a realistic model and it can work. Again, part of the biggest downfall of this process is the amount of people that exercise the option which is less than we would like, but keeping these properties – you also continue to build your equity and you buy down the notes. You get the depreciation and those other things start to grow. So that’s not a bad thing, either. Joe: So this is a great way to do it. This required no money and it required no credit. All it required is your effort to follow through with the step by step system of putting together subject-to deals, of finding buyers for those subject-to deals and filling those properties. And you do this all without risk because you’ve got so many contingencies in the deals that you’re doing that and if you don’t find a buyer for the property that you buy, you don’t close it. I think the whole beauty of this system is that you never have to close a deal until you know that it’s going to make you money, so instead of everybody doing zero down (which everybody talks about and I talk about as well) you’re not really doing zero deals. What you’re doing is cash out deals, all the time, without using your credit. So it’s very exciting stuff. Joe: That’s the Millionaire Matrix. it’s a very powerful way to buy properties. It creates cash flow for you upfront so that you can have a sustainable business and it also creates that long term growth and wealth building that anybody needs if you want to retire from this business and be wealthy. It’s an exciting process. This, by the way, is what I teach in my six month program. It’s what I teach in my Push Button Method. So, either one of these programs will get you into more detail about exactly the step by step process of how to put all of that together. I’d love to work with you and to help you and make your business and your dream come true on this. Thanks. Bye. also I have a lot of family members that have homes in tampa, FL or other places in florida? Or in California in other real nice fancy places ?? We aren’t having these same problems because of the way we find these leads and the way we talk to them. Learning to make an offer that is credible and solves the seller’s problem is the most important part of my training. Most of my training programs start with these techniques. Don’t let the conversations with a few sellers color your entire view of seller financing – it’s all in how you find the leads and then present the offer… either through email, websites, voice, text and email blasts and by phone. Is Singapore real estate consider a free nation….? What about Singapore students using your techniques? What about the due on sale clause in the note that you are taking over? 99% of all mortgages in the nation have “Due on Sale” clauses built into them as standard language. It says that if you sell your house without paying off your mortgage, they have the right to foreclose. We have purchased and sold over 500 homes “subject to” over the last 20 years and have NEVER had a lender foreclose on one of our properties for this reason. The reason they don’t is, we make our mortgage payments. Lenders are in business to collect payments on loans. They are not in business to take back properties… especially properties that don’t have much equity. Lenders have credit scores just like you and I. 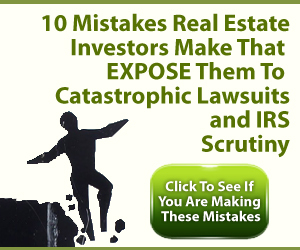 Their credit is damaged if they have a foreclosure on their books. If they get too many foreclosures, they will not be able to make loans. They do NOT want your house back… especially in these tough times for lenders. The pundits are estimating that one million houses will go into foreclosure this year. I seriously doubt that lenders are going to be looking for houses to foreclose on if the payments are being made. I hope that explains my position on this. How would this be implemented in todays real estate with shortsales??? Yes, I have students I’ve trained doing this in Canada too. I’ve had students in Canada, the UK, Australia, France, Belgium, Malaysia and Costa Rica use these techniques. Most free nations transfer property based on a system created in 14th century England, so it’s easy to translate my techniques just about anywhere in the free world. I live in Canada and just wanted to know if you have this same system going in Canada.and do you have anybody in Canada that could help me get started here. 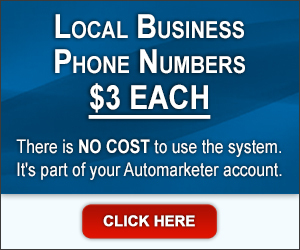 Can You Show Me How To Automate My Business? How Does The Six Month Mentor Program Work? Where Is The Best Market To Invest? 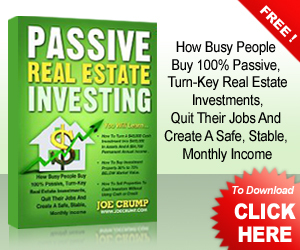 Can I Invest In Real Estate Part Time And Succeed?